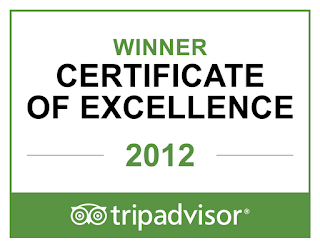 Hale Moana Bed & Breakfast has been awarded the Trip Advisor 2012 Certificate of Excellence. This Award is an outstanding achievement and recognizes Hale Moana Bed & Breakfast for its leadership in Quality of Service and Value in 2012. 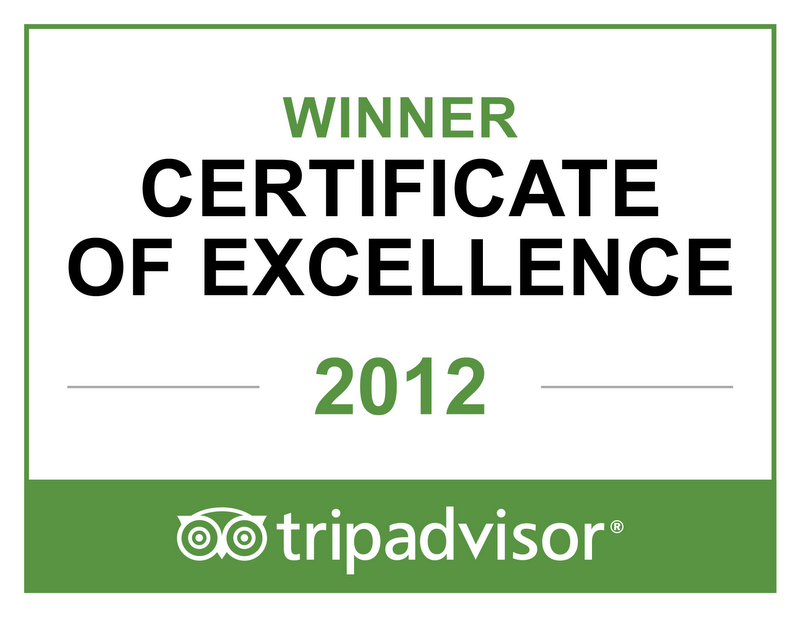 We would like to express our sincere Mahalos to all of our guests and local partners for your continued support 2012! Kilauea inspires the sharing of traditional hula and chants at the hula platform, a sacred site facing Halema‘uma‘u Crater, the home of the volcano goddess Pele. 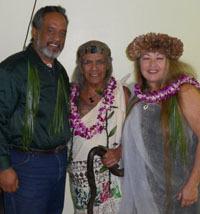 This VAC program features a Hula Kahiko Informance with kumu Leilehua Yuen and Manu Josiah. 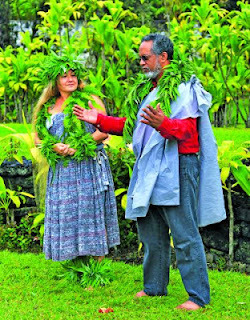 A 50-minute narrated demonstration of the preparation, protocol and offering of traditional hula and chant at the hula platform in Hawaii This outdoor presentation takes place rain or shine at the hula platform located near Volcano Art Center Gallery. The audience is encouraged to bring sitting mat and sun/rain gear. On the same day, there is a hands-on cultural demonstration from 9:30 am to 1:30 pm at volcano Art Center Gallery porch. Hawai`i Volcanoes National Park. All events are free (donations welcome); park entrance fees apply. At 3:15 on a sunny day in Ka‘u, Jamie Gilmore sits at her table, meticulously painting every petal, flower and sand granule in her watercolor portrait of hinahina, a hardy yet vulnerable native plant indigenous to Hawaiian beaches. Now scarce in the wild, hinahina produces tiny white flowers with a sweet apricot scent, a perfume you can almost sense as Jamie’s painting comes to life. “Hinahina just kind of creeps along the sand,” says the artist. “I like drawing attention to plants that are taken for granted—the true survivors of this rugged volcanic landscape, the ones who have evolved to be the purest remaining expression of the Hawaiian Islands. 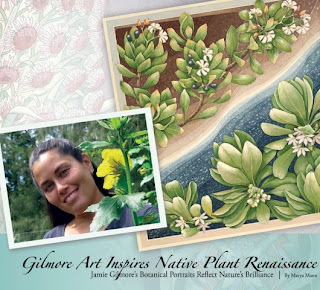 The well-being of native plants and sharing their beauty through art is Jamie’s life work. At the age of 37, she finds magnificence in nature where most people aren’t looking, and she brings their natural, dignified grace into the spotlight. 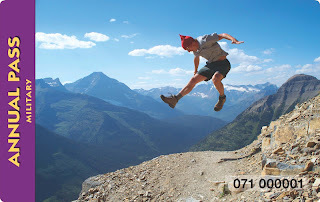 “On hikes, it was never about reaching the scenic vista for me. It was always about the miniature ferns, colorful lichens and small, beautiful stones along the way.” She would look at the ground, she says, while others were excitedly pointing across giant chasms of space to unreachable views of valleys and mountain ranges. 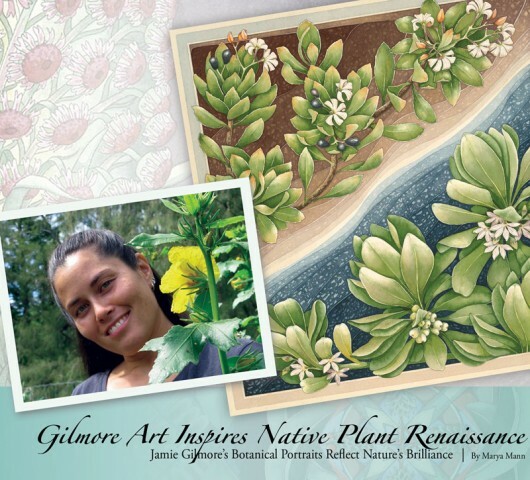 Jamie’s love of art and plants goes back to her childhood. She started drawing at the age of two, a result of being an only child in a rural area with no friends her age. In her early 20s, she started gardening in northern California and became enamored with the profusion of rhododendrons and Pacific dogwoods dotting the luxuriant slopes of white-capped Mt. Shasta. Earning a B. A. in Fine Arts from California State University at Chico merged her two loves: nature and painting. Then came a new adventure: she and her husband moved to the Big Island in 2003 and started building their Ka‘u cabin by hand, from the ground up. “When we moved to the island, I was devastated. I didn’t know any of the plants around me. I felt so alone, like oh my God, where is my plant family?” Learning about native plants helped her to get a feel for Hawai‘i’s extreme conditions and the varied multi-cultural surroundings. Strong, drought-resistant and tenacious, native plants reflect the rough countryside where they grow. 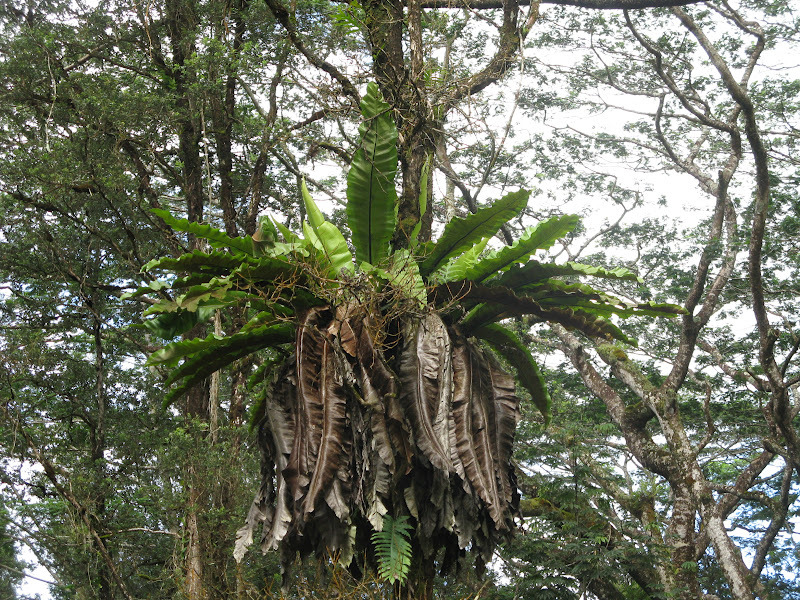 Pushed by people, animals and invasive species to choose out-of-the-way spots where they could flourish, Hawaiian endemic and indigenous plants have adapted extraordinary survival skills. They cling to remote cliffs, conserve resources, and maximize every endurance pattern known to botanical life. Highlighting these “original pioneers of Hawai‘i” in watercolor, Jamie Gilmore is on a quest no less inventive and no less intense. “They came here long before humans ever got here,” says Jamie. “Every plant expresses its own unique geometry, and I love to play with that, use it in my designs,” Jamie says. These motifs repeat in her signature borders—elegant frames customized for the main subject in the portrait. With her Japanese archival ink pens, round-shaped synthetic brushes (# 0, 1 & 2) and French Aquarelle permanent pigment watercolors, she echoes the life-giving shapes inherent in the plant’s organic form. Her stylized art deco and mandala-like edgings remind viewers of the geometric perfection in nature. The journey behind Jamie’s watercolor in dusty shades of purple and frosted green of another native plant began long ago when the first Hawaiian silversword seeds arrived as drift debris on ocean waves or on the wings of a prehistoric bird. ‘Ahinahina found a home between 5 and 10 million years ago on the wind-swept alpine desert of the tallest mountain in the world, Mauna Kea. Known as the “crown jewel” of Hawai‘i’s native flora, ‘ahinahina evolved in such rugged conditions on the high slopes (6,000 – 12,000 feet) of only three mountains in the world—Mauna Kea and Mauna Loa on the Big Island and Haleakalā in Maui — that they had no predators until 300 years ago. Nested in sharp volcanic cinders and nutrient-poor soil, they survived drought, snow, wind, and extreme ultra-violet rays from the sun, but there was no need to develop thorny or toxic protection from animals. By 1820, thousands of Mauna Kea silverswords had spread rosettes of dagger-shaped leaves, covered with silvery hairs to reflect light and heat, over the amethyst-colored slopes. 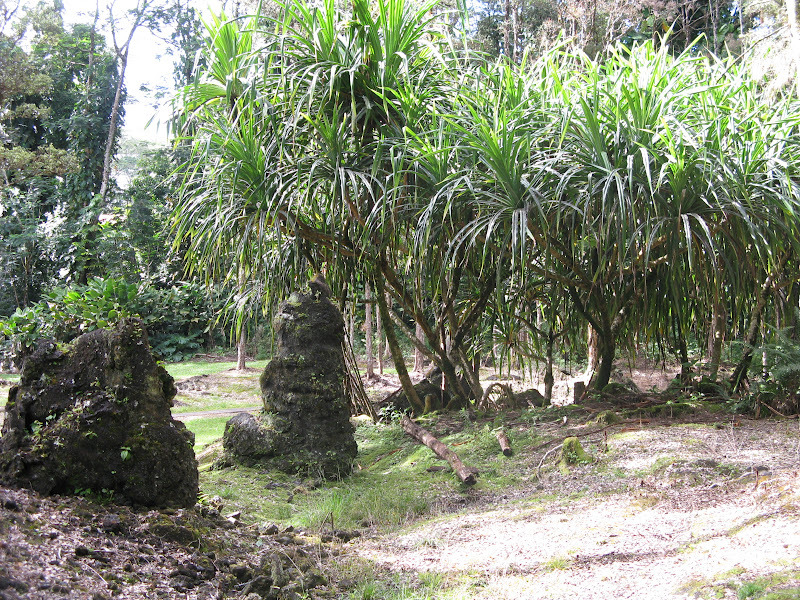 The Hawaiian word hinahina means “silver” or “gray,” and thus applies to many island plants, but the grand spires of ‘a-hinahina were so unique and abundant that cowboys sang songs about the blinding glare of the sun reflecting on their leaves. In a glorious outpouring of creativity, most silverswords flower only once after growing for 20-50 years. Stored water in their aloe-like leaves is especially vital then; sufficient moisture is needed to support a fast-growing 6- to 9-foot flower stalk, which generates about 600 magenta and yellowish green flowers. Each of those flowers generates 500 more tiny rosettes, making the blooming silversword spire a beacon of pollination and regeneration. Poor land-use practices allowed sheep, feral cattle and other alien (non-native) ungulates to browse and nearly wipe out the Hawaiian silversword species. The decimation was barely kept in check by feral dogs until they were eliminated in 1921, leaving ‘ahinahina exposed and in danger of species extinction. Tourists, up through the1960s, often broke off silversword leaves to prove they had climbed Hawai‘i’s volcanic mountains and the native Hawaiian yellow-faced bee (Hylaeus), the plant’s primary pollinator, was ravaged by aggressive ants. Although non-native honeybees visit the sunflower-like blooms, they steal pollen rather than move it between plants. This genetic bottle-neck became so life-threatening to the majestic silversword that botanists declared that every Hawaiian silversword seed should be sought, saved and cultivated. The wild population of Mauna Kea silversword at one point dwindled to 32 plants growing outside of Waipahoehoe Gulch; the Mauna Loa silversword declined to 300 individuals at its lowest count. The Hawaiian Silversword Foundation and the Volcano Rare Plant Facility have teamed up to propagate new silverswords, assuring that out-planted populations have maximum genetic diversity for long-term fitness and survival. Together with efforts by the Hawai‘i Division of Forestry and Wildlife, the U.S. Fish and Wildlife Endangered Species Program and the University of Hawai‘i, an extraordinary cooperative effort is saving and regenerating these plant treasures. Employees at the 116,000-acre Kahuku Ranch at Hawai‘I Volcanoes National Park have erected a 6-foot fence to protect 700 silverswords from sheep and an amazing 83 percent of new plantings are surviving. 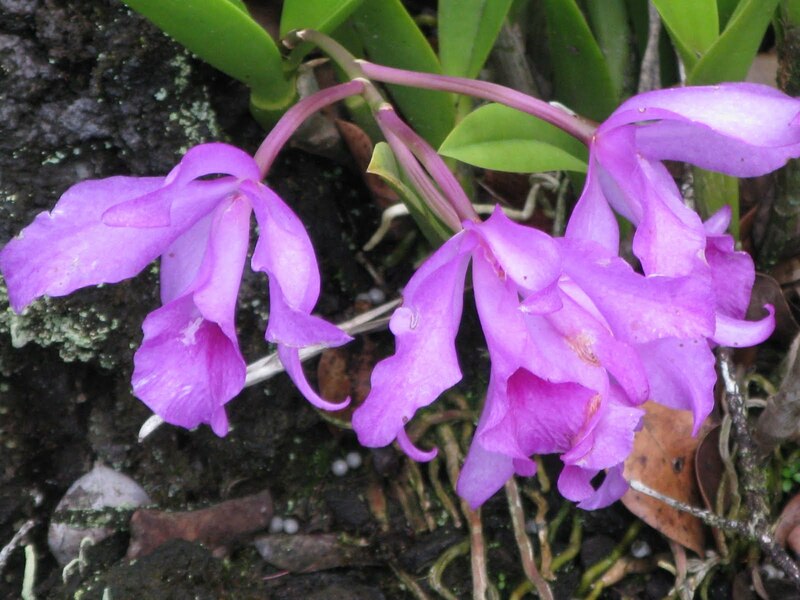 In just six short years, a once-dwindling treasure has become a survivor, a testament to how committed people, volunteers and effective agencies can reclaim the island’s botanical heritage. For their heroic efforts to succeed, the brave hand-pollinators must locate a blooming plant, often rappel over a cliff or climb up a rock face to reach it, and dangle on a rope to collect a vial of the tiny yellow grains from the flower. Then they go in search of a second flowering silversword, which often requires another careful ascent or descent to reach it. These gutsy botanists then use a small brush to delicately paint the pollen on the second plant’s sticky stigma where germination can occur. 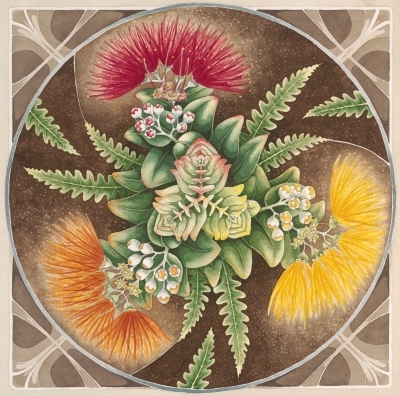 Jamie Gilmore’s brush strokes resonate with the geometry of the ancient plants, the brushes used by daring scientific silversword seed-savers, and the exaltation of life in the multi-species effort to regenerate Hawaii’s native flora. Hardy, hard-to-find “true natives,” who have survived on-island longer than anyone, are patient, resilient and steady—traits needed to adapt in the thrall of evolution. These treasured plants, illuminated by the brushstrokes of the watercolorist, make a picture that tells more than a thousand words: they share nature’s time-tested wisdom. 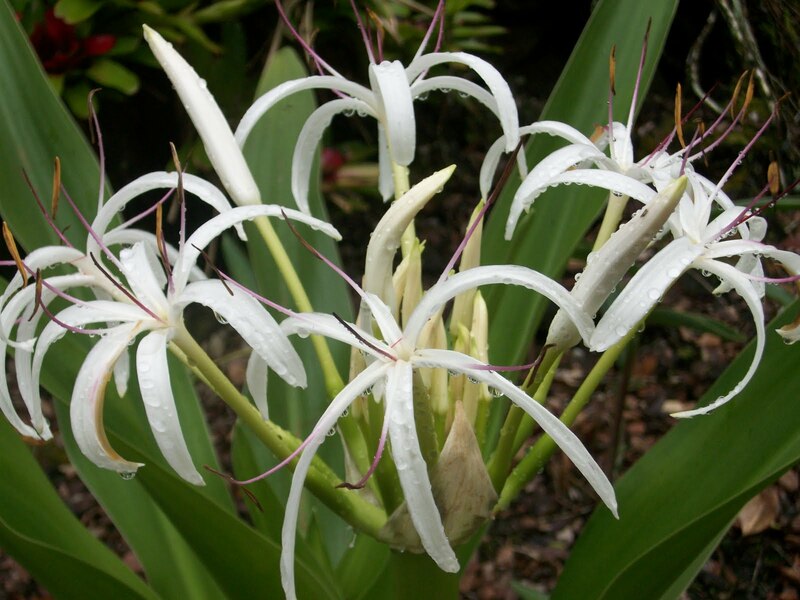 • Hawaiian Silverswords are protected by state and federal law. Anyone who takes plant material—seeds, flowers or small plants—from their habitat is subject to heavy fines. Report infractions to www.fws.gov/endangered. The Mauna Kea Visitor Information Station’s free monthly program, “Malalo o ka Po Lani,” will be held on Saturday, May 19, 2012 at the Onizuka Center for International Astronomy Visitor Information Station’s presentation room, beginning at 6:00pm. The presentation will take place for approximately one hour, with our stargazing program following shortly thereafter. This Saturday, we will be presenting “I’ll Weave a lei of Stars for You” at Culture Night on Maunakea. It should be a fun evening, with stories, chants, songs, and a short tour of the Hawaiian constellations after the presentation. The language of the lei is as rich and complex as that of any other specialized field of endeavor, and as steeped in heritage. This Saturday, at the Ellison Onizuka Center for International Astronomy Malalo o ka Po Lani program, cultural practitioner Manu Josiah and I will host a presentation on the language and culture of this iconic emblem of Hawai`i. The one-hour program begins at 6:00 pm in the facility’s lecture hall. Each month, different Cultural Practitioners share perspectives on aspects of Hawaiian culture, history, and or arts relating to the natural history of Maunakea. The “Malalo o ka Po Lani” cultural program is held on the third Saturday of every month in the Ellison Onizuka Center for International Astronomy Visitor Information Station’s presentation room at the 9,300 ft elevation on Mauna Kea. For more information on programs at the Mauna Kea Visitor Information Station please visit our web site: www.ifa.hawaii.edu/info/vis or call us at (808) 961-2180. Seating for this free program is on a first-come, first serve basis. 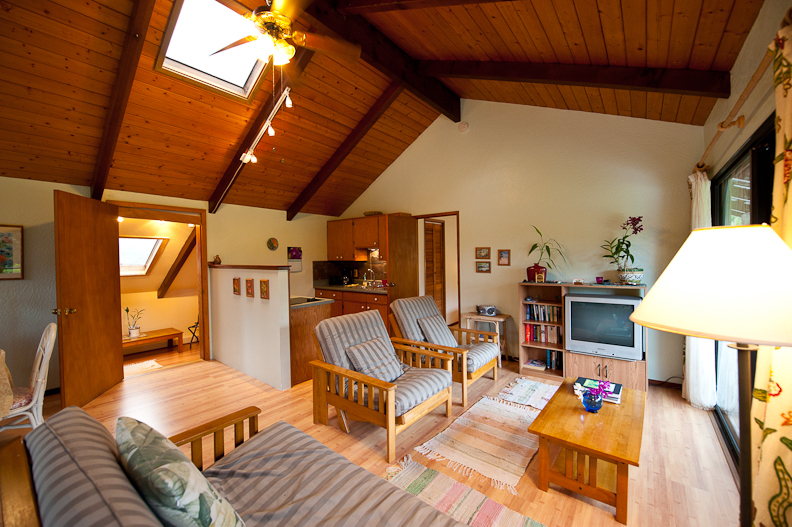 Stay at Hale Moana Bed & Breakfast and visit the Hawaii Volcanoes National Park! Hawaii National Park, Hawai‘i – To show our appreciation for those who serve in the U.S. Military, on May 19 – Armed Forces Day – the National Park Service will begin issuing an annual pass offering free entrance to all 397 national parks for active duty military members and their dependents. Every Monday at 9:30a.m. and Saturdays at 11a.m. 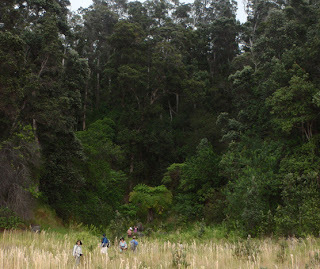 volunteers lead visitors on a free tour of the forest's treasure trove of native plants. Giant hapu'u pulu tree ferns, with their golden "fur" or pulu, grow alongside the rarer hapuu 'i;i, which have stiff, bristly hairs instead of pulu; sometimes towering above both, slender and graceful, are even rarer meu ferns. 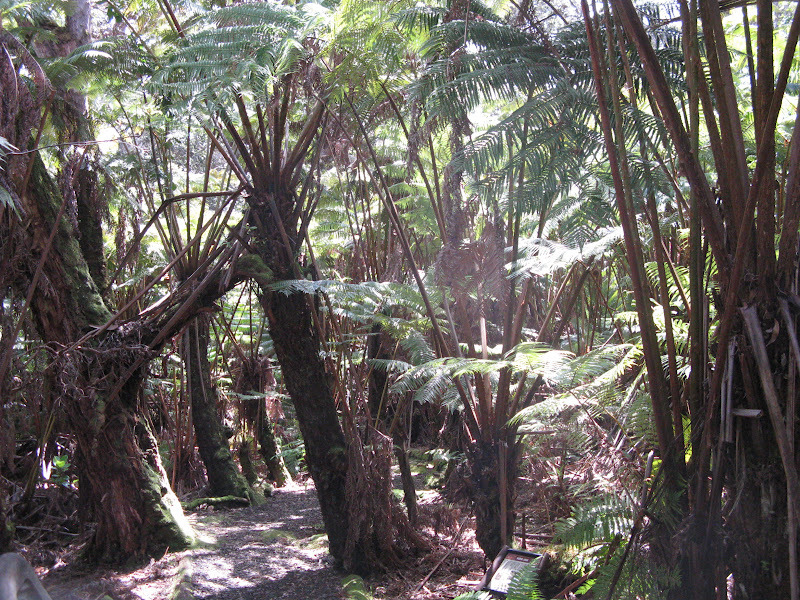 In their shade grow all types of smaller ferns: shrub-sized 'ama'u, viny uluhe, delicate, foot-tall ho'io. 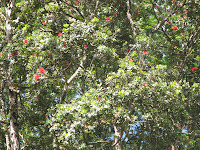 Visitors frequently hear the distincrive whirring of 'apapane wings as the scarlet-colored native birds flit among the ohi'a trees, feeding on their red blossoms. 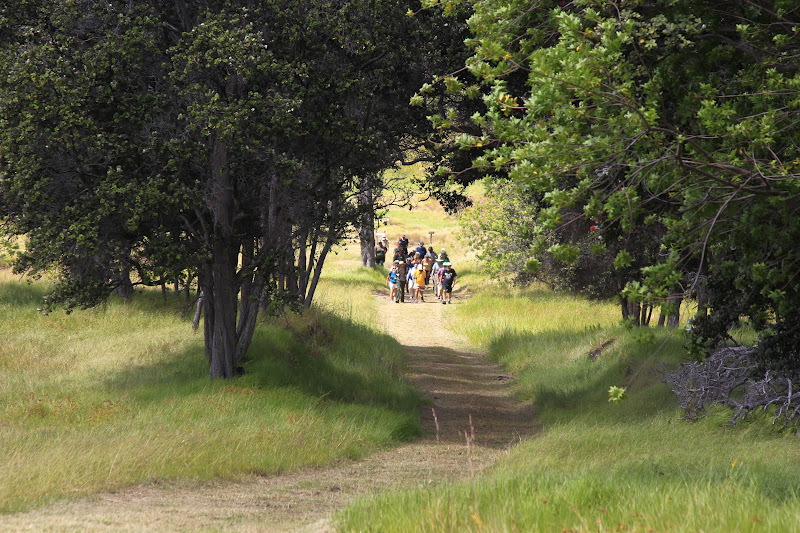 Amanda Spaur, who coordinates the tours, notes that the forest walk attracts a different kind of visitor, "People are genuinely interested in knowing what Hawaii really is," she says. "It feels like everyone you share it with is gaining from the experience." 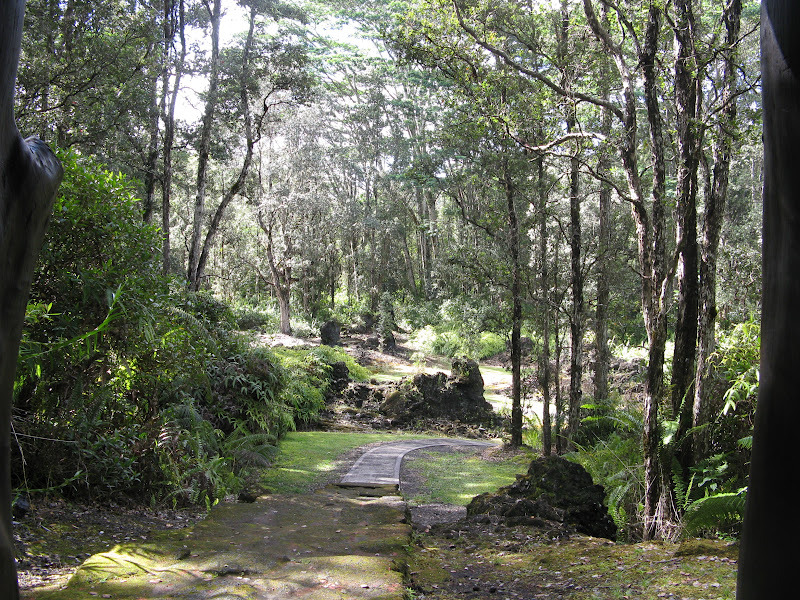 Those who can't make the Monday or Saturday tour can still explore the forest with a tour brochure, available in the Volcano Art Center's main building in Volcano Village. Check the Volcano Art Center's website or call (808) 967-8222 them for details. For directions click here. Hawaii National Park, HI – Two adventurous programs offered by Hawai‘i Volcanoes National Park will introduce a captivating landscape, biodiversity and history of the park’s southernmost section to intrepid hikers. Kīpuka‘akihi is a challenging 1.5 mile, five-hour adventure to see some of the rare plants and wildlife that inhabit this treasured kīpuka. 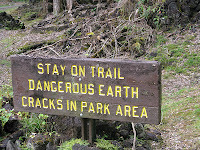 Participants must be prepared to scramble over fallen trees, lava rock, and slippery, wet terrain. Wear sturdy hiking shoes, long pants, sunscreen and a hat. Bring raingear, garden gloves, a day pack, insect repellent, lunch and water. This forest stewardship program provides opportunities to help protect this rainforest by pulling up invasive kāhili ginger and other invasive non-native plants throughout the kīpuka. Due to the fragile nature of the region, the program is limited to 15 people and pre-registration is required. To sign up, call (808) 985-6011. 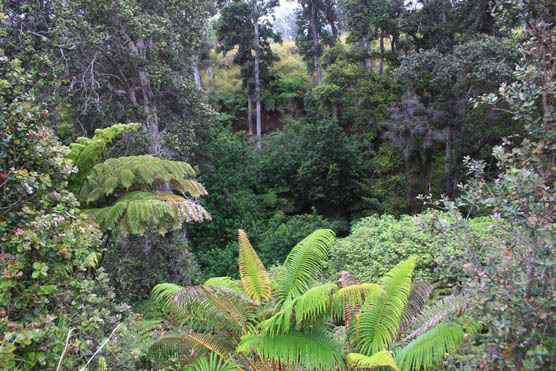 This expedition into Kahuku’s isolated refuge of rare plants is offered May 26, June 17, July 28 and Aug. 25 from 10 a.m. to 3 p.m. Meet near the Kahuku gate, which is located off Highway 11 between mile markers 70 and 71 on the mauka side of the highway. Park and meet inside the gate near the ranch buildings. This Lava Tree State Park is 1.5 miles from Hale Moana Bed & Breakfast and it is a true jewel - vegetation, lava formations and the whole scenery. The park has been recently completely up-graded and re-done, including the walk ways, pavilion and little shelters, information displays and parking area. The State takes care of the maintenance and landscaping and is doing a very good job with it. The park is absolutely beautiful and visitors to this area should not miss it. Because it is at a strategic location from the B&B, travelers can easily tuck a visit to the park onto their day as they start in the morning on their way to other sites or when they come back to the B&B at the end of their day. The 0.7 mile trail takes you through a forest of lava tree molds of various shapes and sizes. Allow 30 minutes for a leisurely walk along the loop route. The path is paved, but there are slight inclines as the path follows the natural topography. The path may also be wet and slippery after periods of rain. If it starts to rain take cover in one of the two rest shelters along the way. 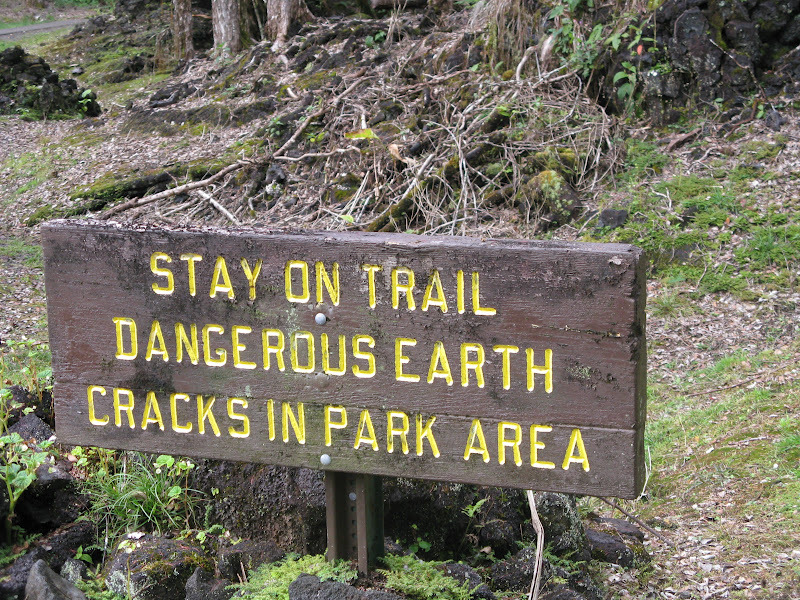 It is recommended to stay on the path as vegetation hides cracks and uneven terrain. Visitors are asked to protect and preserve these special volcanic features. Climbing and touching the molds will hasten their deterioration and collapse. There are about 85 tree molds preserved in the park. You will be able to view about 40 of these molds along the path. 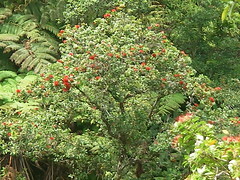 A forest of mature 'ohi'a trees with red lehua blossoms has covered these lands of Puna for over 200 years. 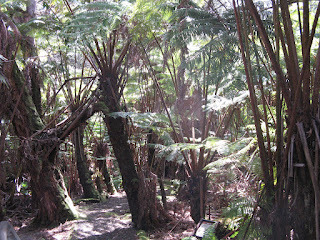 A variety of hapu'u, uluhe and sword ferns carpet the forest floor. 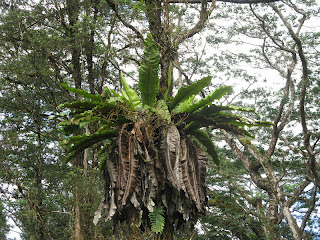 'Le'ie vines climb the 'ohi'a trunks, while bird nest ferns perch in the branches. The plants thrive in the rich, moist organic soil formed atop the earlier flows of pahoehoe lava. What happened in this area is this: In the 1790 a fiery eruption of Kilauea sent red hot lava flowing down the slopes of the volcano. Crackling and thundering sounds of falling and burning trees followed in the wake of the lava flow. The tree molds recorded the maximum thickness of the lava as it passed the 'ohi'a trees. Lava trees formed when fast flowing pahoehoe lava encountered wet 'ohi'a trees. The lava receded quickly after large chasms opened up caused by earth quakes. A stark black landscape remained. The ropy texture of the pahoehoe lava marked the exterior of the molds as the lava cooled and hardened against the tree trunks. In a matter of months, new life appeared with the growth of lichens and ferns in the moist cracks of the lava. 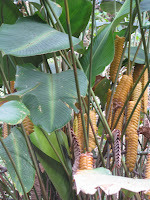 Today, there are many different varieties of gingers, heleconias, ti plants, taro and other tropical species. 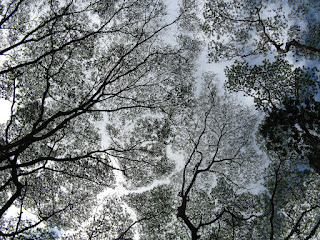 Albizia trees, an invasive species brought in from Africa by the lumber industry, create an incredible canopy high above the whole area. 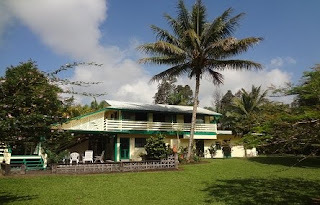 30 minutes from Hale Moana Bed & Breakfast: Stay here and visit the Volcanoes National Park! Saturday, May 12, 2012 from 11:00 a.m. to 2:00 p.m.
SATURDAY WALK IN THE PARK. 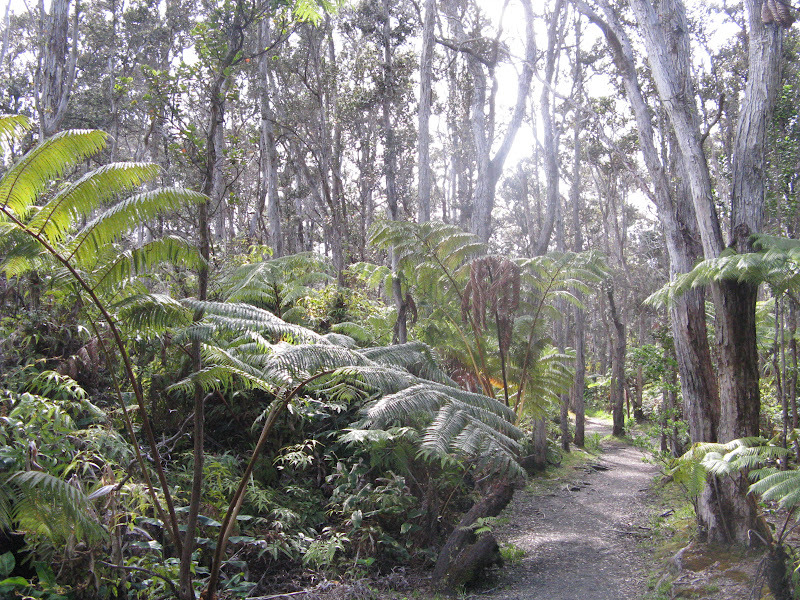 This monthly program, usually held on second Sundays, is aimed at bringing together the members of the Friends of Hawai‘i Volcanoes National Park to share in the park’s beautiful trails. For May only, we changed our walk to the second Saturday so as not to conflict with Mother’s Day. 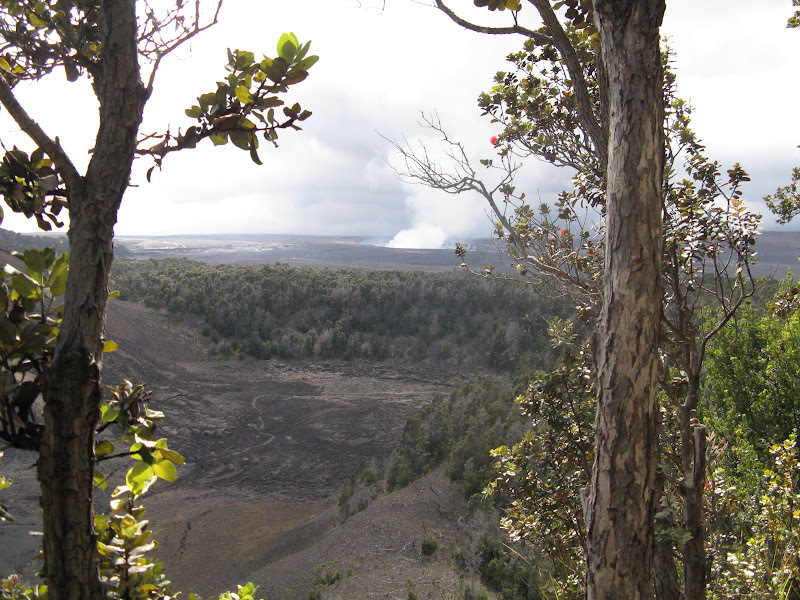 Led by Cheryl Gansecki, this month’s four-mile hike will explore Kilauea Iki Crater, beginning and ending at the Kilauea Iki Overlook parking area. The walk is free to Friends members (though non-members are welcome to join the non-profit Friends group in order to attend). Park entrance fees apply. To register, contact the Friends at (808) 985-7373 or admin@fhvnp.org. For more info, visit www.fhvnp.org. VOLUNTEER FOREST RESTORATION PROJECT. 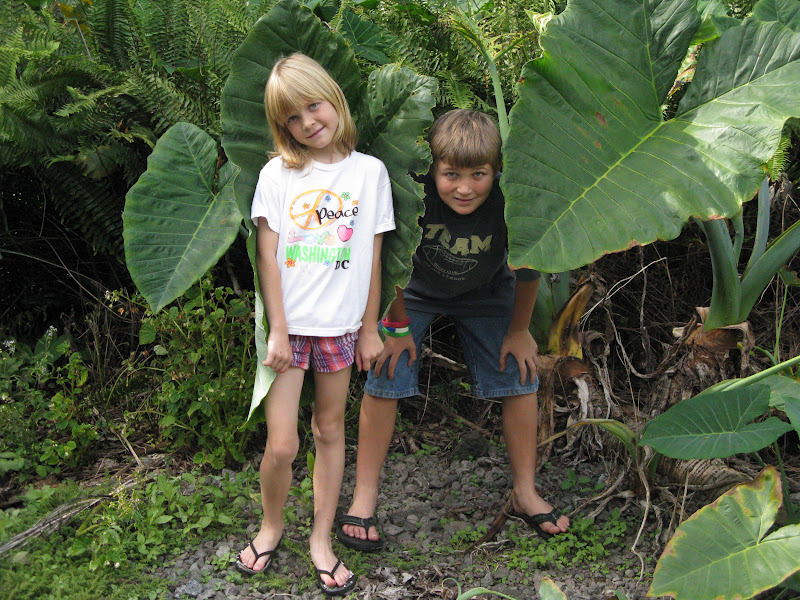 May 19 is National Kids to Parks Day, so this month’s project will be kid- and family-friendly. 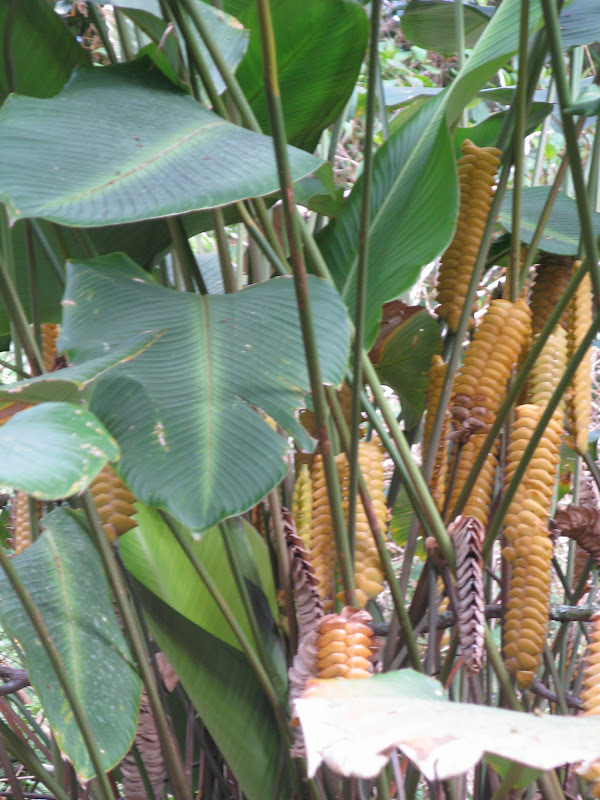 We need the community’s help to plant native seedling trees and remove invasive ginger. We'll be working in the Kilauea summit area of the park, not far from the Kilauea Visitor Center. We hope kids of all ages come out and bring their families to learn more about the park's native forest restoration efforts. Volunteers can be any age, and children must be supervised by a parent or guardian. Work takes place within 1/4 mile of the parking area, with access on a fairly easy trail. Our goal is a crew of 24 people, and pre-registration is required. To register, contact the Friends of Hawai‘i Volcanoes National Park at (808) 985-7373 or forest@fhvnp.org. For more info, visit www.fhvnp.org. SNEAK PREVIEW! Sunday, June 3, 2012 from 10:00 a.m. to 3:00 p.m.
KONA TRAIL SNEAK PREVIEW AT KAHUKU. Help us celebrate National Trails Day®! 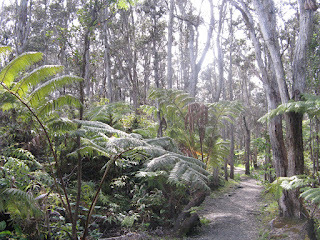 Join park ranger John Stallman for a guided interpretive walk along a new loop trail at Kahuku. This four-mile roundtrip trek through the scenic highland pastures offers participants a sneak preview of the Kona Trail, which is not yet open to the general public. Excellent bird-watching opportunities abound, plus learn about the natural and cultural heritage of this special place. Cost per person is $50 for Friends members and $70 for non-members. Students (K-12 and college with valid student ID) are half-price. Non-members are welcome to join the non-profit Friends group in order to get the member discount. 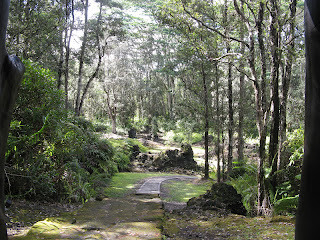 To register, contact the Friends of Hawai‘i Volcanoes National Park at (808) 985-7373 or visit www.fhvnp.org. 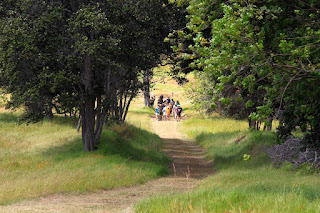 Tours are led by expert instructors and naturalist guides who combine scientific understanding with detailed personal knowledge of Hawai‘i Volcanoes National Park. Informal teaching techniques and participant-guided learning make these personalized adventures not just educational but also fun. 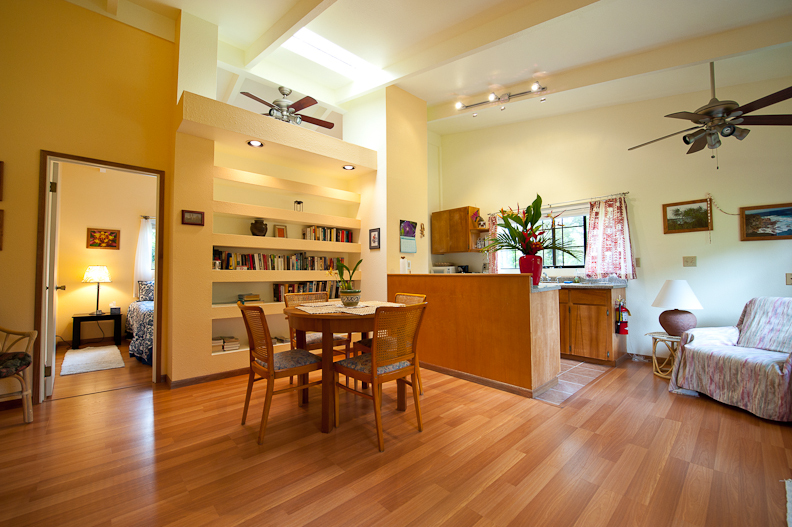 To set up your INSTITUTE-ON-DEMAND private tour, call (808) 985-7373 or email institute@fhvnp.org. For more info, visit www.fhvnp.org. 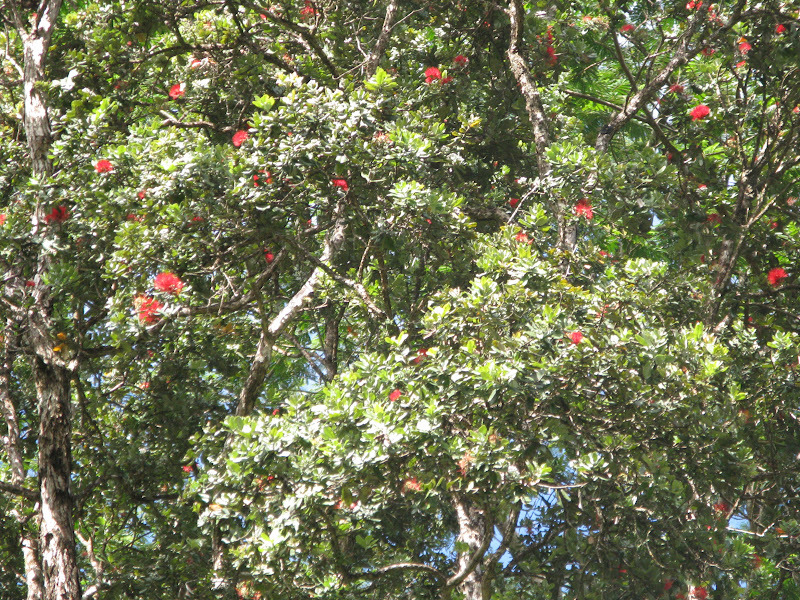 Discover the 'ohia trees and lehua blossoms in the beautiful garden surrounding Hale Moana Bed & Breakfast! Sharing these pretty red 'ohia lehua blossoms with you on this Lei Day (May 1) on Hawaii Island is sharing the Aloha and our sincere Appreciation for our visitors, friends, family and the community we live in. By the way do you know the legend behind the beautiful flower and tree? 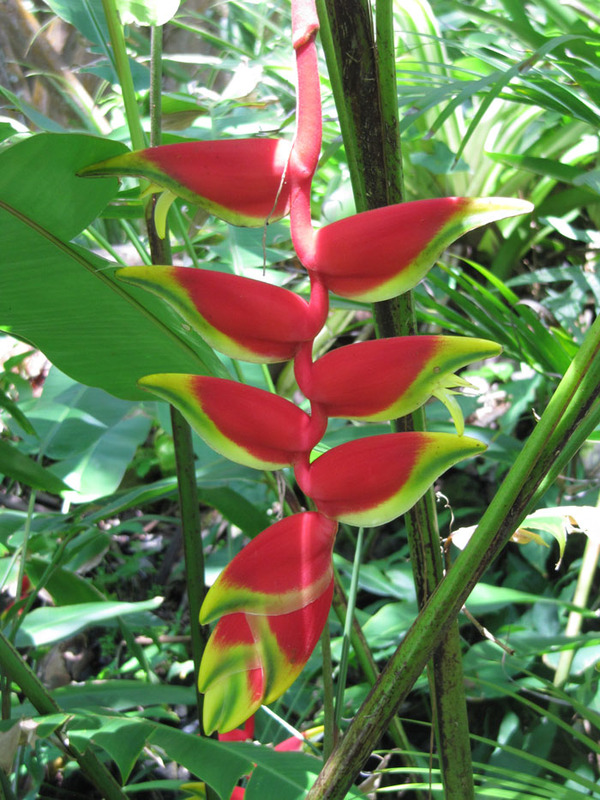 When you are in Hawaii, you may notice a unique tree with twisted looking branches and a bright red bloom. That’s the 'ohia tree. 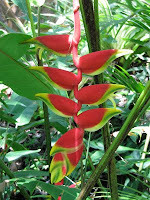 It’s native to Hawaii and can be found on all the islands. I like to think of this tree as being the little train that could of the tree family. 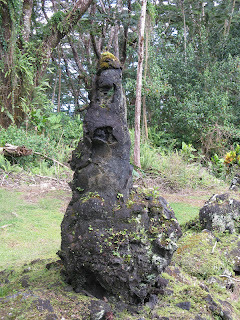 The reason being is it is one of the first trees to grow in lava. What determination! In fact when you visit Hawaii Volcanoes National Park on the Big Island, you’ll probably notice 'ohia bushes and ferns providing the first dots of vegetation in a field of lava. There’s an interesting Hawaiian legend tied to the 'ohia tree and its flower, the lehua blossom. As you might expect, the legend is tied to the volcano goddess, Pele. The legend says that one day Pele met a handsome warrior named 'Ohia and she asked him to marry her. The problem was Ohia had already pledged his love to Lehua. Pele was furious when Ohia turned down her marriage proposal, so she turned 'Ohia into a twisted tree. Lehua was heartbroken, of course. The gods took pity on Lehua and decided it was an injustice to have 'Ohia and Lehua separated. 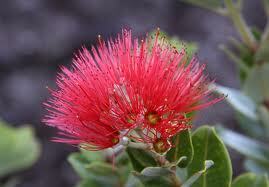 So, they turned Lehua into a flower on the 'Ohia tree so that the two lovers would be forever joined together. That’s a bit of a fiery love story, isn’t it?